This great promotion was recently spotted in one of the stores in Zhuhai. 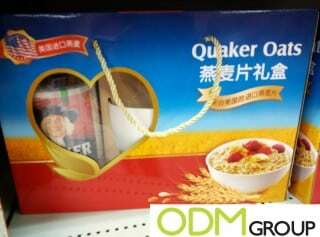 The famous oatmeal brand Quaker Oats is giving away gift sets, during their marketing campaign. In a gift box you can find the package of oatmeal and the customized ceramic bowl. Such marketing tool as on pack promo gifts greatly help brands to boost their sales and increase revenue of the company. Why do we think the customized ceramic bowl is a good idea? Firstly, everyone likes getting free gifts and it’s already proven that goods with on pack promo items are more attractive for the customers than standard goods. Giving away the customized ceramic bowl as a marketing gift the Quaker Oats is showing their clients that they are taking care of their needs. Customized ceramic bowl is also a good choice of the marketing product as it perfectly complements the main product. Secondly, such on pack promo helps to increase sales. Gift packaging attracts a lot of consumer’s attention and the customized ceramic bowl greatly adds perceived value to the product. Customers will feel that they are getting so much more than they are paying for. Thirdly, the most important marketing tool is branding. Quaker Oats branded their promo gift in their company style. While developing your marketing campaign remember that customized products has very high efficiency. The printed logo will raise your brand recognition and will become a long term advertisement for your company. While customizing your product match the panton colours of your company, keep the corporate style and print the logo. Gift packaging also can give you extra printing space for the better visibility of your brand. If you need further assistance please contact us here. We will be glad to help you with your inquiries and Mindsparkz will assist you with creative and interesting design.